I Me My: Iranian Soccer Players Face Lifetime Ban - 'Justice', Ahmedanijad Style? 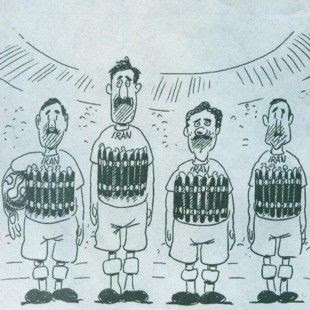 Iranian Soccer Players Face Lifetime Ban - 'Justice', Ahmedanijad Style? As if the widespread reign of terror and oppression wasn't enough, now Iranian authorities unleash fire on sportsmen! "Ahmadinejad, a known football fan, has taken a close interest in the sport's affairs. In 2006 Iran was banned from international competition by the world governing body Fifa after claims of improper interference by his government. The ban was later lifted. IT might be to distract the attention, so the real horrendous events are not that noticed, and other things are paid attention to. wow.. i dont have the context to any of this.. but why exactly would a green band create such a ruckus in the first place? Green has become a signature color of the protests against the disputed re-election of Mahmoud Ahmadinejad as Iran’s president. Besides, the FIFA does not allow for players to display political alliances on the field other than the countries they represent. I could understand if the FIFA had imposed some penalty on the players for violating the rule, but the Iranian Gov. imposing a 'lifetime ban'!!?? I believe your country, Argentina, is also going through some difficult times with Kirchner and her spouse; these are some trying times around the world: Iran, Honduras, Argentina, Pakistan, Iraq, Afghnistan... the list seems endless. yes they are great players and now they cannot play for their beloved counrty... and it is interesting that after the gov. 's ban, FIFA condemned this act... but alas! The soccer is the best sport around the world and every country should have the opportunity to play it with the FIFA's rules.Nice blog.